Qatar Executive, the private jet charter division of award-winning Qatar Airways, has taken delivery of a second brand new Gulfstream G650ER. 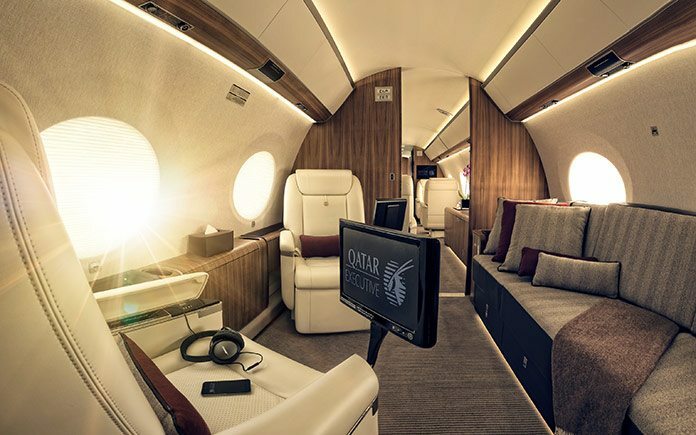 In time for the upcoming busy spring and summer season Qatar Executive now has two luxurious Gulfstream G650ER aircraft ready for charter to meet the requirements of its affluent clientele. There are very few business jets of this calibre available in the charter market and as such the Gulfstream G650ER is highly sought after among the global travelling elite, who value its phenomenal range capabilities, industry leading cabin technology and unparalleled passenger comforts. The Gulfstream G650ER aircraft can easily fly non-stop from the Middle East to North America or from destinations in Asia to Africa – further, faster than any other jet of its kind – and is perfectly suited for those whose travel needs include flights halfway around the globe. Qatar Airways Group Chief Executive, His Excellency Mr. Akbar Al Baker commented: “We are delighted to welcome a second Gulfstream G650ER to our expanding private jet fleet, and to be able to provide our clients with more flexibility, and an enhanced product portfolio. Since Qatar Executive welcomed its first Gulfstream G650ER in to its dynamic private fleet, the airline’s charter operation has received an excellent market response from the travel-savvy private jet community who recognise the speed and range benefits that this aircraft offers on ultra long-haul sectors. They received its first G650ER in December 2015, following an order for up to 30 new market-leading business jets, including Gulfstream’s all-new G500 and G600, for which Qatar Executive is the global launch customer. The second Gulfstream G650ER features an identical cabin interior as the first G650ER, which was delivered at the end of last year. The spacious state-of-the-art aircraft has a two-cabin configuration and seats up to 13 passengers. Seats convert into fully-flat beds, so that seven guests can easily sleep on board, and also provides a three-seater-divan in the jet’s aft cabin. The G650ER’s cabin interior is kept in a classic-contemporary style, combining understated luxury and timeless elegance through a natural colour palette ranging from earthy tones of the walnut brown wooden veneers to the china-white leather seating and finest woollen Loro Piana fabrics with soft brown fishbone patterns. 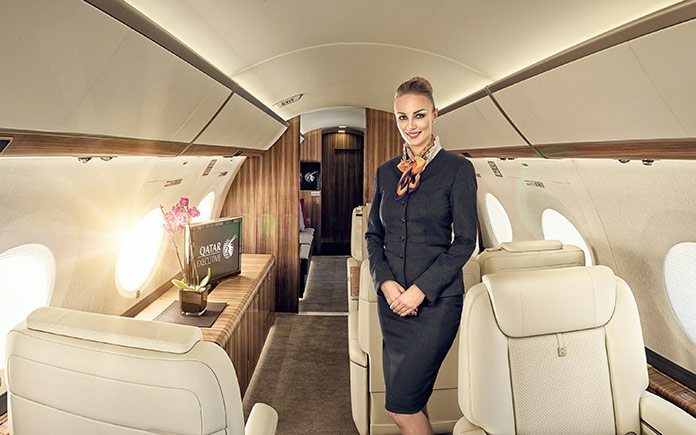 The G650ER’s cabin is not only comfortable but contains the most advanced technology including satellite communications, high-speed internet, wireless local area network and Gulfstream’s Cabin Management System, which allows passengers to use their own personal electronic devices to control audio, video, lighting, temperature, window shades and other cabin functions. The interior cabin has 16 panoramic windows, the largest in business aviation, which are perfectly positioned so that every passenger has their own window. Further stand-out features of the Gulfstream G650 are the fact that it has the lowest equivalent cabin altitude of any business jet and the cabin air is replenished 100 per cent every two minutes. The G650ER can travel 7,500 nm/13,890 km at Mach 0.85 and 6,400 nm/11,853 km at Mach 0.90 – so customers can travel at 90 per cent of the speed of sound. 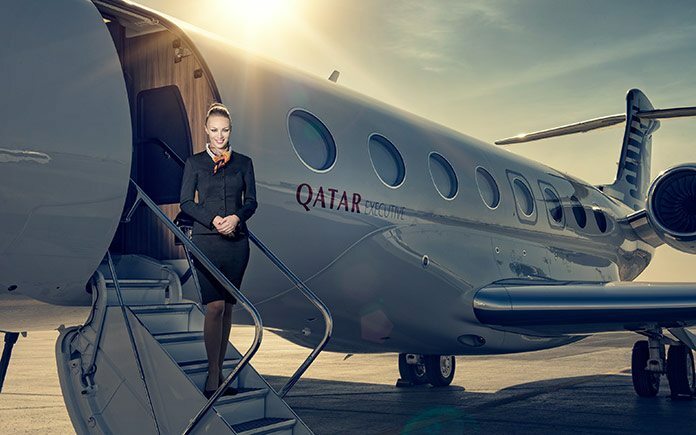 The G650ER complements Qatar Executive’s existing long-range fleet of one Gulfstream G650ER and eight modern Bombardier aircraft, including three Challenger 605s, four Global 5000s, a Global XRS, and a 40-seat Airbus A319 All-Premium Class aircraft, all available for worldwide charter.